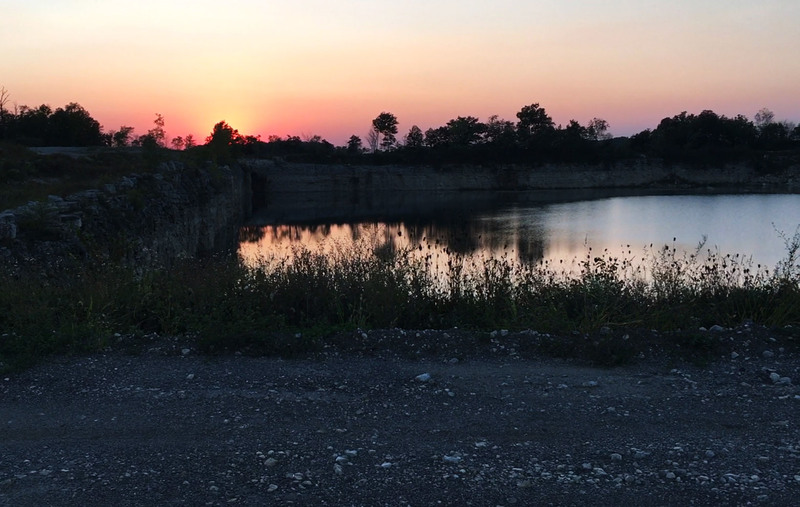 Oct. 9, 2017 – Opponents of Benton Township quarry dumping are concerned about the possible long-term health effects from contaminants leaching into groundwater as a result of Rocky Ridge Development LLC dumping spent lime sludge into the quarry. 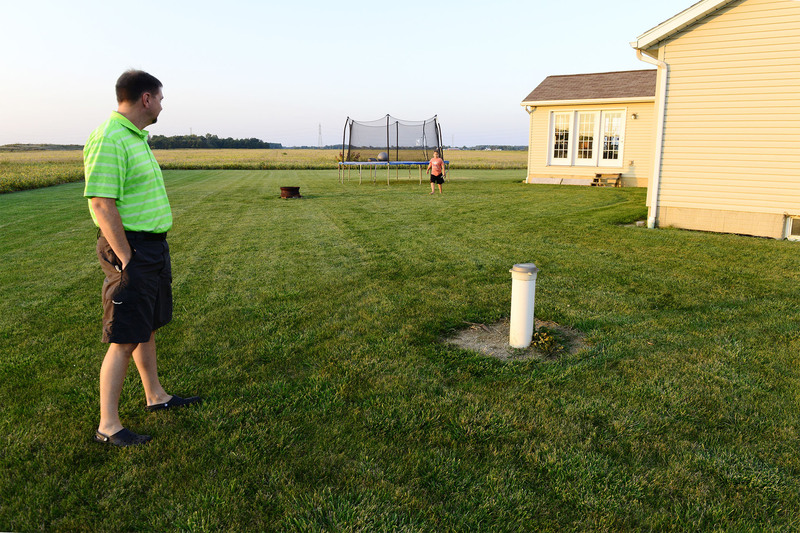 Josh Noble, 43, of Benton Township stands next to the groundwater well in his backyard. He has lived his entire life on property overlooking the former Stoneco quarry, which before spent limestone dumping he described as “like a nature preserve.” He built a house for his wife and family next to his father’s that he grew up in. He began to have concerns over the quality of his well water three years ago when Rocky Ridge Development LLC bought the fractured limestone quarry in 2014, and used it to dump spent lime sludge trucked from Toledo’s Collins Park Water Treatment Plant. 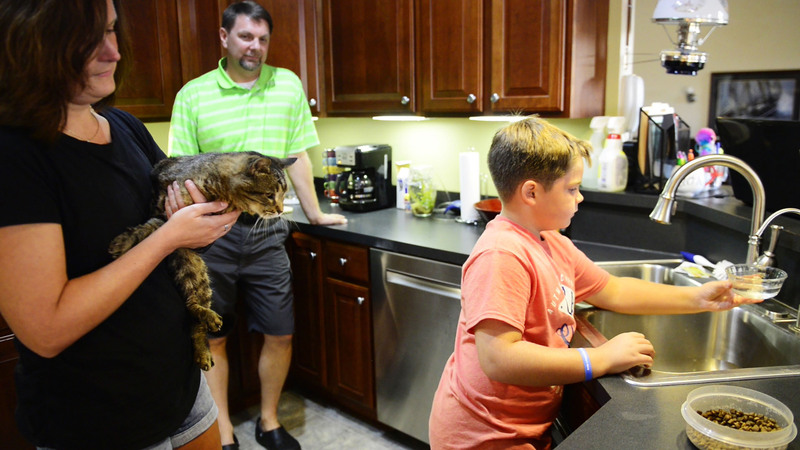 Christy Noble, from left, her husband Josh, and their son, Henry, 9, give their cat Oscar a drink of water from their well. 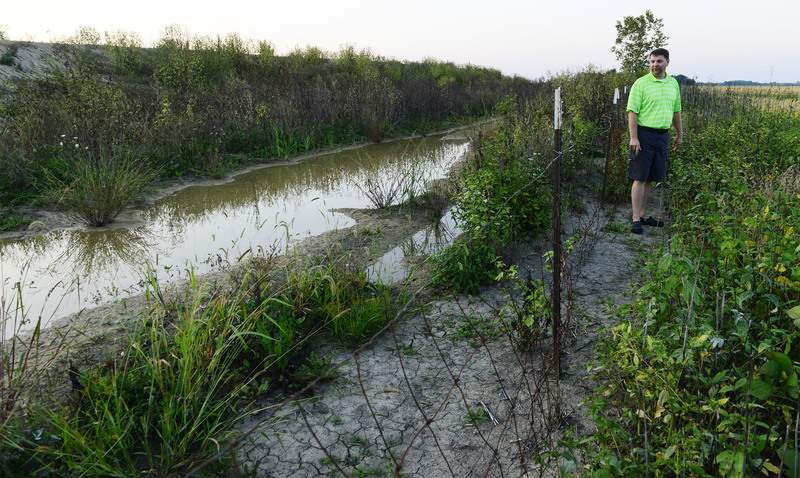 The Nobles own a home on Toussaint North Road in Benton Township and are worried about their water well, which is only a few hundred yards away from Rocky Ridge Development LLC’s quarry operation. Josh and Christy Noble of Benton Township installed a reverse osmosis water filtering system in their home in 2016 to increase the safety of their drinking water. Christy Noble drinks a glass of water from her groundwater well. The Nobles installed a reverse osmosis water filtering system in their home in 2016 to increase the safety of their drinking water. Josh Noble said the natural flow point from the quarry is through his field, into his yard, and to the ditch beyond his house. He said he is worried about contaminants from lime sludge dumping in the water that has flooded his yard. 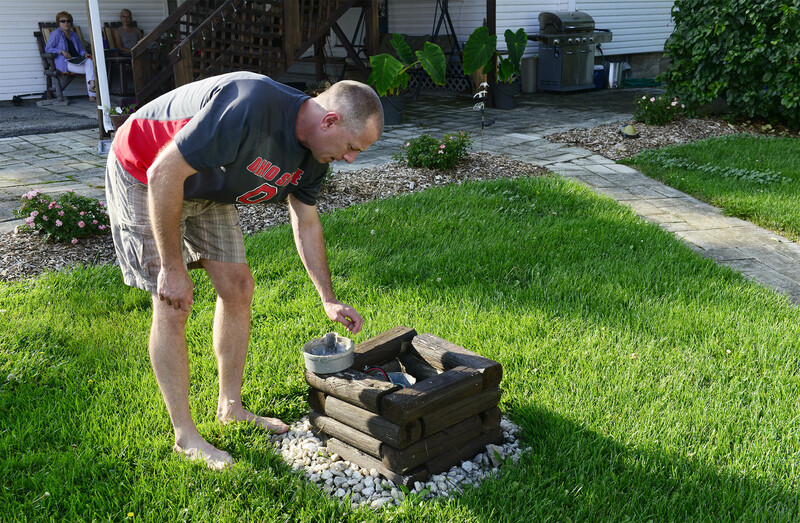 Rich Herrig shows the well in his backyard in Benton Township where he draws water from the ground into his home. 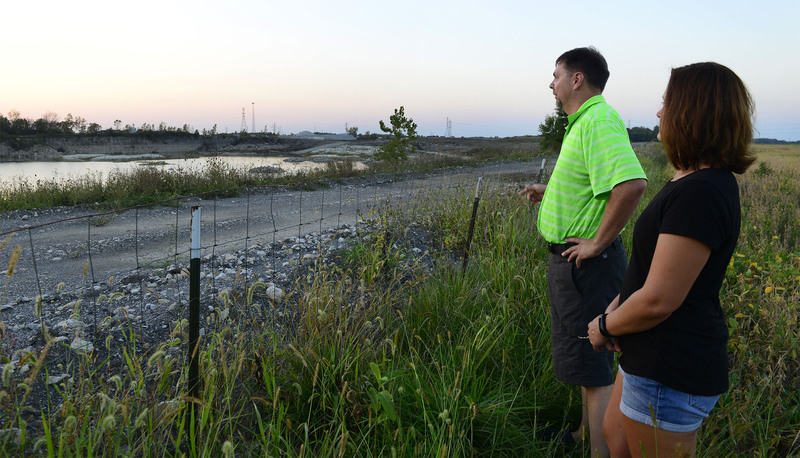 He and his family do not drink the water because of health concerns over contaminants that are in the residual sludge being dumped at the nearby Rocky Ridge Development LLC quarry. They still use the well water for bathing, dishwashing and to give to the animals to drink. 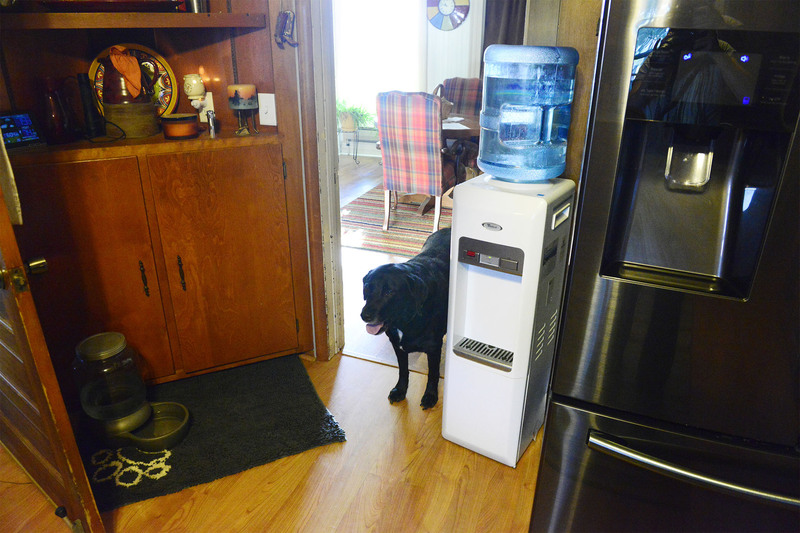 Mia, a black Labrador retriever, stands in between a jug of purchased water the family drinks and the well water she drinks. 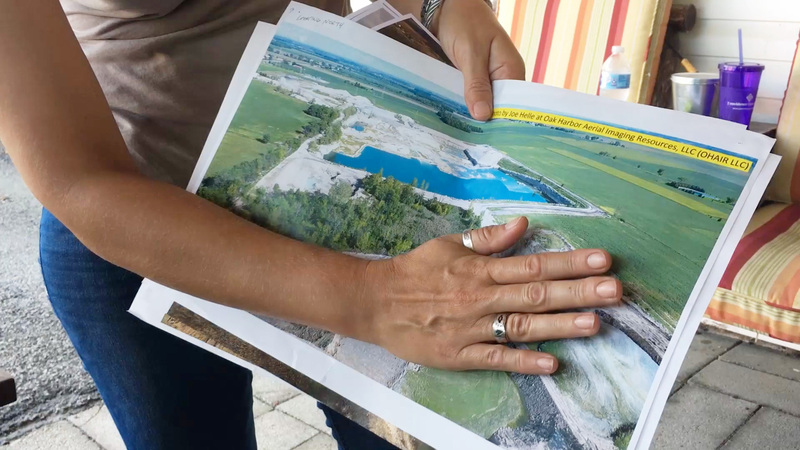 The dogs have started having health problems and Angel Wadsworth fears it is from contaminants in the residual sludge being dumped at the nearby Rocky Ridge Development LLC quarry. Angel Wadsworth picks a non-GMO tomato she grew in her backyard. 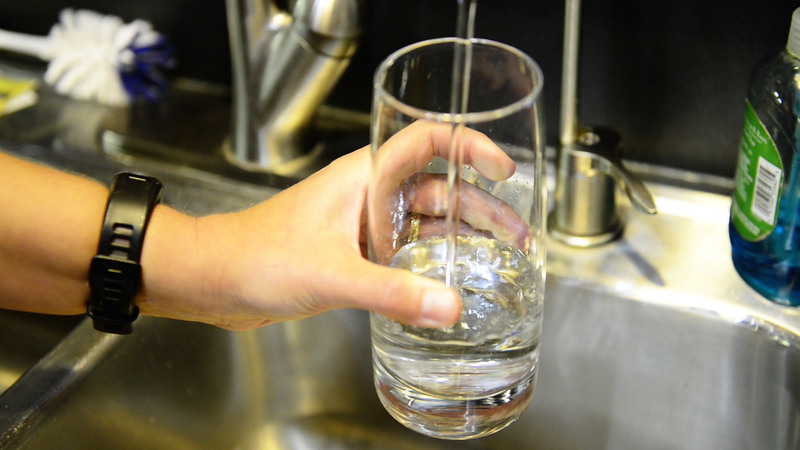 She does not drink the water because of health concerns over contaminants that are in the residual sludge being dumped at the nearby Rocky Ridge Development LLC quarry. She still uses the well water for bathing, dishwashing and to give to the animals to drink. 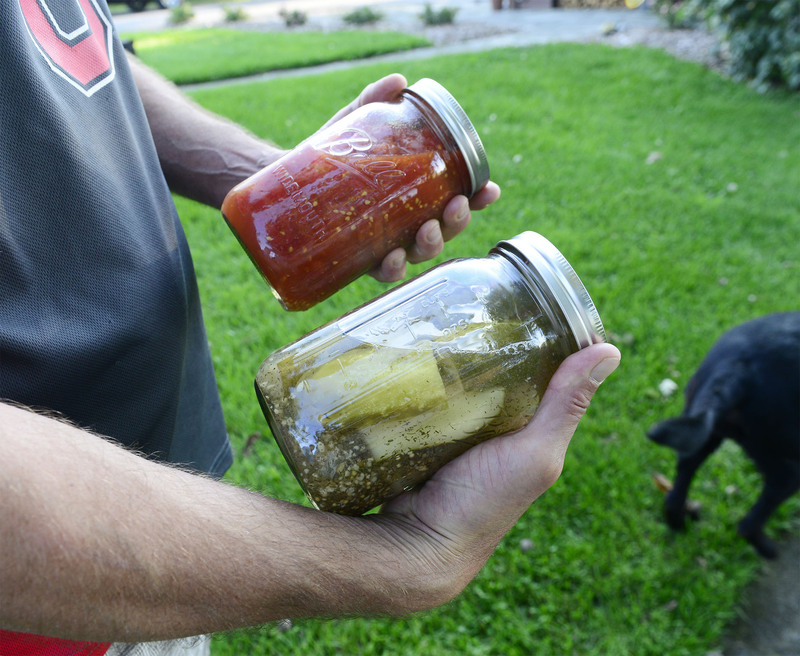 Rich Herrig and Angel Wadsworth enjoy canning the vegetables they grow in their backyard, fed from the ground water. They are concerned the vegetables contain contaminants from the residual sludge being dumped at the nearby Rocky Ridge Development LLC quarry. 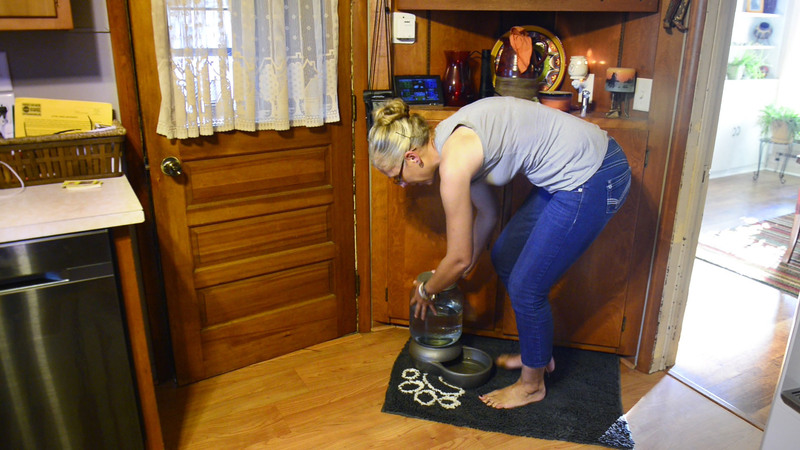 Angel Wadsworth gives her dogs water drawn from the well in their yard. She is concerned with giving her dogs the water to drink after the dogs have started having health problems. Rich Herrig, left, and Angel Wadsworth bought their Benton Township home located on Ohio 590 next to the quarry in 2016. 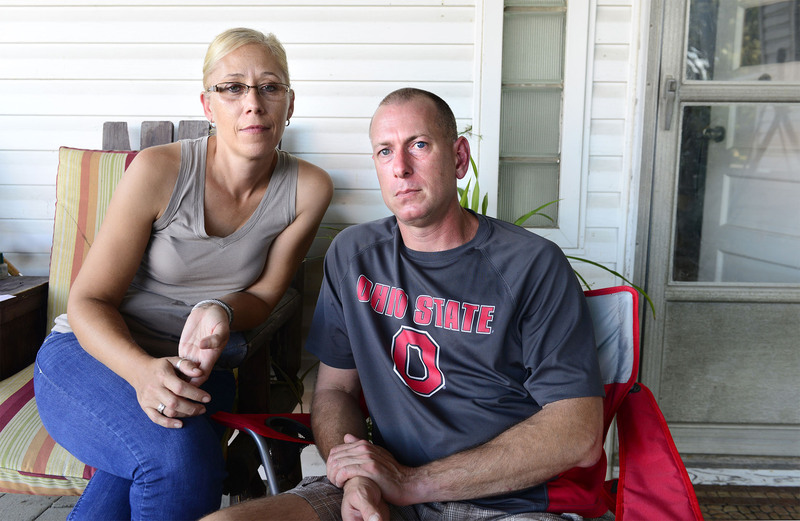 Angel Wadsworth, left, and Rich Herrig and do not drink the well water beneath their Benton Township home because of health concerns over contaminants that are in the residual sludge being dumped at the nearby Rocky Ridge Development LLC quarry. They still use the well water for bathing, dishwashing and to give to the animals to drink. Rocky Ridge Development LLC has applied for a permit to dump the spent lime sludge directly into the quarry pit. A pending alternative waste management plan proposed by Rocky Ridge Development LLC could allow for up to 3.6 million cubic yards of blended lime sludge and soil to be dumped directly into the quarry pit.